I'm a bit less discombobulated than I was yesterday (and definitely better than this morning!). I'm looking forward to candle-lighting tomorrow evening, and to my final exam on Tuesday. 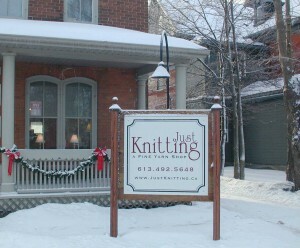 I'm looking forward to going to Carleton Place on Saturday for our final visit to Just Knitting. In a very sad (for me) turn of events, Kelly has decided to close her brick-and-mortar store and continue her business as an online-only retailer. If you're local to Ottawa, I highly recommend that you pop by this weekend, or at some point next week to check it out! If you're not local, well, now you can enjoy Kelly's shop as well, as it'll be in cyber-space! Good luck, Kelly! We're going to miss you!!! Janie (formerly of Janie H. Knits in Perth) hasn't made it out to a knit night yet, but she is very much enjoying her retirement, by all accounts! Can't wait to see her again! So I had a moment this morning. My daughter was getting ready for school. She came out of her bedroom wearing head-to-toe skin tight grey spandex... a pair of barely-decent leggings and an off-the-shoulder top that showed the matching bra straps beneath... I just about had a stroke. "GO CHANGE!" I bellowed. "But why?" she asked, puzzled. "Because you look like a cougar heading out on the town!" I roared. She burst into tears, and yelled at me, "But it's the only thing I have that I like! I need to wear this!" Did I mention that my daughter is 11 years old? Prostitot, indeed! I did win the argument, and she did take the outfit off. I have since confiscated the top - not sure where it came from, but this kid owns more clothes than my ex, my son and I all put together. She gets second-hand designer stuff from my mom's neighbors which is sometimes questionable (although I've gotten pretty good at weeding through it before it enters my house) and her grandmother takes her shopping several times a year. All I know is, she won't be seeing THAT top again, and I've turned into my parents. I only wish I could drink wine. I feel like this is a wine moment. I'll be in the corner sobbing into some Haagen Dazs.